A new cycle for Collabor88 starts tomorrow! I love these new pieces from The Sea Hole by Drinkinstein Sorbet, who is also the creator of the Collabor88 event. I have a thing for bold and bright colors, and this new collection has plenty of that! The colors can be worn together to create a coordinating outfit, or mix-and-match and create eye-popping looks. 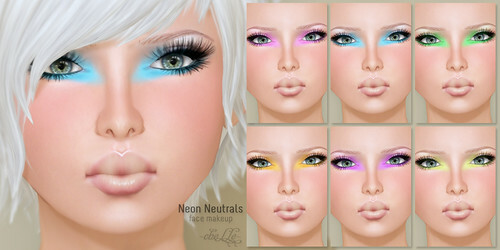 ✿ cheLLe ✿ is releasing a makeup set that coordinates with this month’s Collabor88 color scheme. It is on sale for 58L! so come check it out! The Neon Neutrals face makeup set includes 6 bold & bright face makeups — the eye shadows & faded lipstick combo is on a single tattoo layer and cannot be worn separately. It’ll work with most skins. Visit Collabor88 or check out the Collabor88 website for more previews!